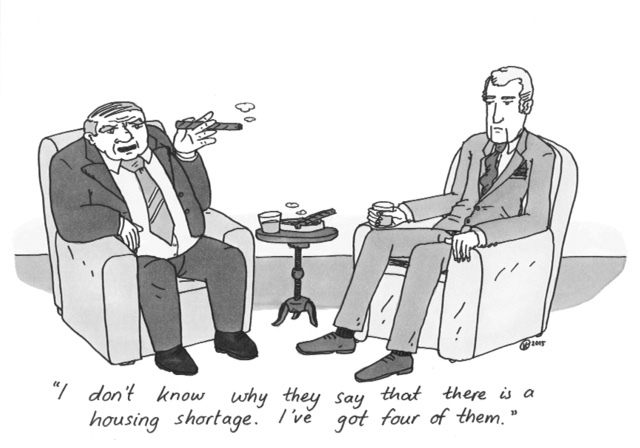 Auckland and Christchurch are in severe housing crises due to a lack of supply among other things. In Auckland, according to Fiona Rotheram in The Listener, the average house price is now $776,729 as of February and is at its highest since before the global financial crisis. An Auckland house now worth $1,000,000, earned $2200 a week last year just from rising prices. The average increase in valuations of housing in Auckland rose 13% last year. If these numbers seem ludicrous it’s because they are. Out-of-control house prices have massive effects throughout the economy and for working class lives. Auckland and Christchurch are anomalies; the rest of the country has had mild to low growth in prices. Christchurch real estate is buoyed by a lack of supply due to the earthquake destroying the housing stock. Auckland is another story. Auckland‘s supply issue is due to a combination of factors: property speculation and lack of central planning. While Christchurch and Auckland are the anomalies, that doesn’t make the rest of the country any more affordable. That same survey reported that Auckland housing is at 8.0 times annual household incomes; Tauranga 6.6; Christchurch near 6.0; Wellington 5.5; Napier-Hastings 5.4; Dunedin 5.2; Hamilton 4.8 and Palmerston North 4.5. Housing is also unaffordable in any of these centres. The media and politicians like Labour’s Phil Twyford and Winston Peters blame international investors, particularly from China, for this massive rise in prices. 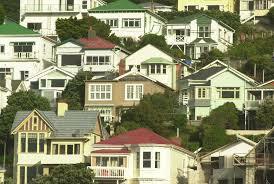 A recent survey from Stuff.co.nz stated that 54% of Aucklanders blame Chinese investors for the rise in house prices. There have been disgustingly racist cartoons in the Herald. This however is a myth. The latest BNZ-REINZ Market survey (March 2014) places the number of foreign buyers at 6.4% – with less than 25% of those from China. First-home buyers make up 17% of this total. Organised investment groups are 19%. The overwhelming majority are those that are buying their second or more properties. Rich people profiting from rental investments are the real culprits, not foreigners. Other warped priorities in our system play a role too. For working people, the family home is their most significant and only financial investment. A whole DIY culture has been promoted around this, and links to people’s fears over superannuation. It is this DIY culture that has been cultivated that has driven these prices up. It is seen as a way, even the only way nowadays to make any money, to buy a house do-it up and sell–it-on, or rent out your properties, people are encouraged to “tap into your home equity”. This works in its own way much like a Ponzi scheme, as long as the prices continue to rise perpetually and you get out of the market and hand off your expensive property to some other sucker before they inevitably collapse under their own overvaluation because nobody can afford to buy it. It is much like a Ponzi scheme in another way – It is heavily influenced and relies upon easy credit. New Zealand’s credit system is unhealthy at best, and at worst, a bubble about to burst. The banking system is heavily tied to both agriculture and real estate markets. The loans typically consist of home loans for exorbitant real estate prices and business loans for dairy conversions and other such developments in our agricultural sector. The New Zealand economy is often thought of as an agricultural nation but in reality all the primary produce, agriculture and forestry add up to a paltry 6.1% of the overall economy. According to the Reserve Bank, the majority of the economy falls into service sectors, which makes up over 63%. The other big part of the economy is the financial sector, which is 28.8% of the economy. The property market relies heavily on the financial sector for financing mortgages and loans to both the agriculture and real estate markets. The loans typically consist of home loans for exorbitant real estate prices and business loans for dairy conversions and other such developments in the agricultural sector. In Forbes magazine last year, Jesse Colombo outlined the 12 most worrying signs for the economy. He states that mortgages alone account for 60% of the banks’ balance sheets and over half of them are floating interest rates. Even more worrying is that these banks account for over 80% of this financial sector. The vast majority of this money that is used to finance those mortgages is not from depositors but borrowed from international credit markets. What this means is that New Zealand has some of the highest “household” debt in the OECD, this includes credit cards, mortgages, other personal and finance loans made to the private citizen. The Reserve Bank states that the total private debt is $208.8 billion dollars; the vast majority of that debt is incurred by the banks giving out these private loans. The government under Labour was actually very good at managing its debt. But since Key, government debt, owed for borrowing money to finance government projects, has ballooned to over $86.9 billion. Combined these two figures give a total of $295.7 billion dollars, with an economy with the total GDP of $240 billion dollars. This brings borrowing up to 123% more than New Zealand earns and as everyone knows it can be very difficult to get an acceptable loan, or even any loan, for that level of indebtedness. With house prices rising into the millions, the dream of owning your own home is out of reach for many New Zealanders. This is even more so for low wage workers. Max Rashbrooke’s book Inequality describes this in detail, where 50% of New Zealanders earn less than $24,000. To be in the top 10% of New Zealand earners you need to earn just $74,000. The drop in earnings has other major effects for the economy not just in property –the average person’s disposable income can’t buy commodities they need. It means that we have to borrow more just to cover this loss of earnings, creating a debt spiral that most young New Zealanders have great difficulty getting out from. When we can’t buy it, even by borrowing, we go without, meaning that the market for commodities in New Zealand shrinks, those who only sell in the New Zealand market slowly go out of business. For property in Auckland this means gentrification, a way forcing working class people that make this city run, further out into the suburbs. Even traditional working class areas are under attack. Already documented in this magazine is the outrage in Glen Innes, but even without the government creating “projects”, the average house price in the South Auckland suburb of Otahuhu increased 74% in the last 9 months pushing out the new generation in communities. New houses are being bought up not by first home buyers but by a landlord class, property is being concentrated in the hands of a relative few, pushing up prices for everyone else and locking the poor out of the market. Property is a speculative form of investment – what you are betting on is that prices rise, interest rates for your mortgage do not, and that you might be able to borrow more for the next purchase. It is the most profitable form of speculative investment in New Zealand. But it is not just here that this occurs, it is a pattern recurring right across the advanced capitalist world. A pattern that has ended in catastrophe for the United States, Ireland, and Spain. For the rich there is no such thing as idle money. Even stored in banks, money flows around the world as capital continuously seeking profit making ventures. If the money was just stored in a bank and never loaned out it would lose value simply by devaluation of currency. The problem with all of these economies is that they have little possibilities for productive investment, due to declining wages and shrinking markets. The amount of cash (capital) flowing from these banks is overflowing and willing to go anywhere – as long as there is a return on investment. The problem is a response to the crisis of capitalism, (explained in C for Crisis) in order to make a productive investment without increasing the overall problems for a crisis of overproduction. This means investing in more dangerous and speculative areas, reducing requirements and checks for loans, and developing new “artificial” markets like derivatives. There is another way to ensure that profits are made on bad investments too, you must force their government to pay for all the bad loans large financial institutions made to your local banks. This is what has been happening in Greece, Ireland and Spain – a bailout of French and German banks not a bailout of the Greek, Spanish and Irish people. Capitalism cannot fix the problems that lie at the core of this economic model. It continuously kicks the can down the road – it shifts its problems around passing on what is an issue of productive sectors return on investment, due to long term lowering of wages and shifting it onto speculative gains in property, without being able to deal with the core issue – a decline in rates of profit. Because the rest of the economy is performing so badly due to these long term problems that a good return on productive investment is now difficult in New Zealand, Finance has turned to ever more speculative ventures to find the continuous profits they need to stay competitive.The property bubble may not burst any time soon however. The housing crisis will not get resolved by the Auckland Council or the Government: private developers earn more on just buying the land and holding it for a year or two than they do by building property on it. The government’s resolution to solve this supply problem is to sell state houses, forcing the already impoverished onto the streets to make a quick buck. But this doesn’t solve any crisis in supply as all these homes are already occupied, the building that the government wants done has been handed off in “partnership” with private developers, who are creating 10% of the houses they build to be “affordable” ($450,000 just under 10 times the average wage). If the supply of houses does get resolved, then that may precipitate a sudden drop in house prices. Even if the International Lenders finally realise we are bad at paying our debts, the government would just step in and throw money at them much like it has happened in other countries. The likelihood of this crisis to resolve itself is small, without political action we will see more and more stories of families of 13 people living in a two bedroom house, or families living out of their cars, and increasing rates of homeless people. This political action will only come from below because the government’s position is clear – John Key on the morning report on 13 April stated, “No I don’t think you can call it a crisis, but prices have been rising…” The reality is that this is just too profitable and too dangerous for New Zealand capitalism to deal with. This I think is encapsulated by the Reserve Bank’s statement in a recent report “the New Zealand housing market is too big to fail”.